I just spent a few days with friends in my favorite type of place – a town full of history. 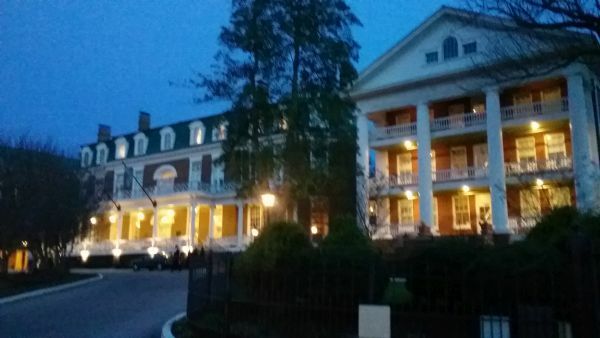 The town is Abingdon, VA, and more specifically, I’ll be telling about the inn where we stayed, the Martha Washington. 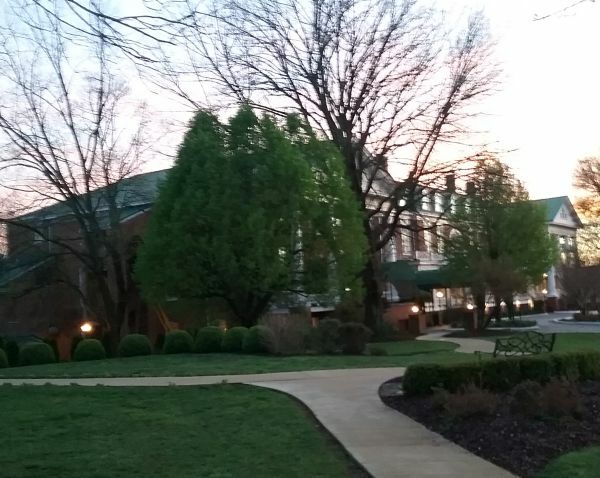 The central part of the inn was built in 1832 as a residence for General Francis Preston and his family. 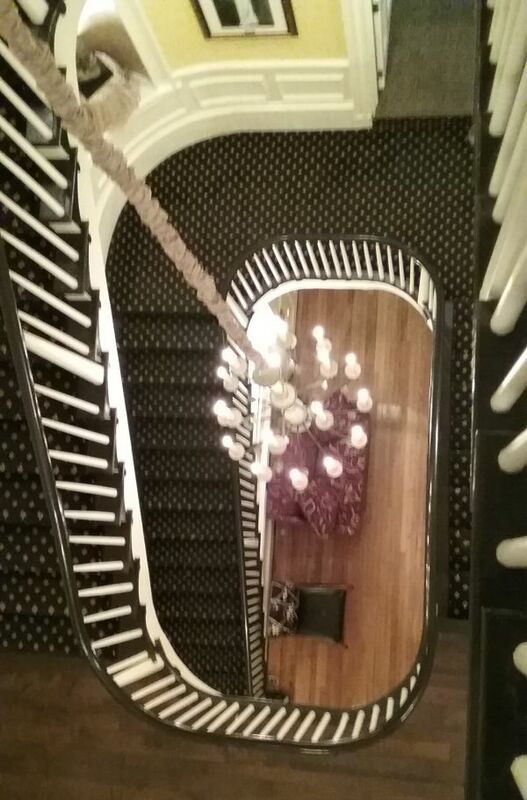 Much of the original structure is intact, including the family’s parlors, and a lovely oval staircase. 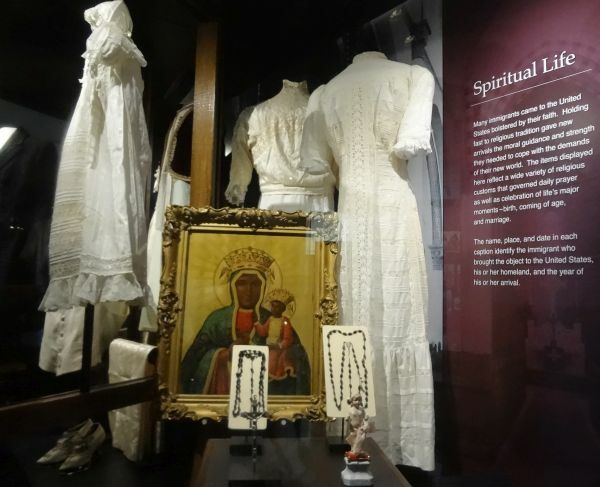 The house was sold in 1858 to the Methodist church, which was in the process of establishing a school of higher learning for girls which was to be named for Martha Washington. The school actually opened in 1860. Over the years the building was enlarged and new wings were added on either side. All the sources I’ve found call the school Martha Washington College, though, especially in the early years, it was really more of a finishing school. A girl could attend for two years if she had graduated from high school, or for four years if she had completed two years of high school. By the 1920s the school was in effect, a junior college. There are a lot of legends and ghost stories surrounding the school, including tragic love stories involving students and Civil War soldiers. I also found a lot of differing information concerning dates. This is a topic in search of a good researcher! 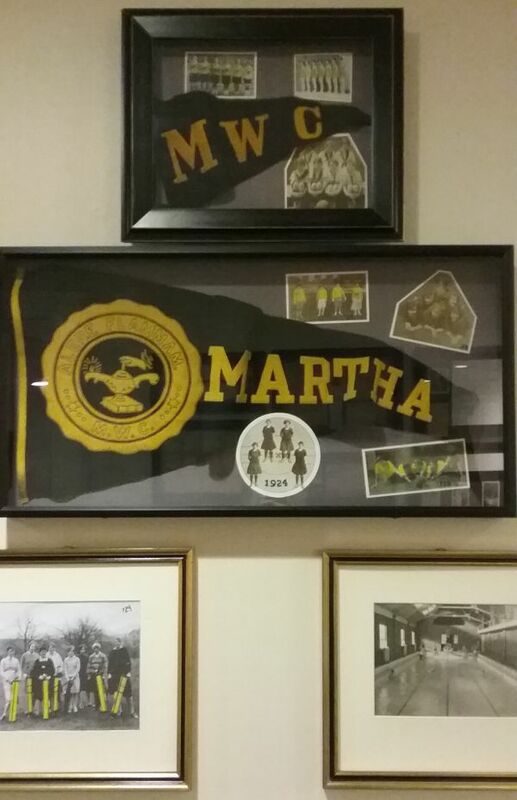 What made the stay at the Martha Washington so interesting to me was the presence of many photographs and other memorabilia concerning the school that lined the walls of the main floor of the inn. Most of it was from around 1895 to 1932, when the Great Depression forced the school to close. 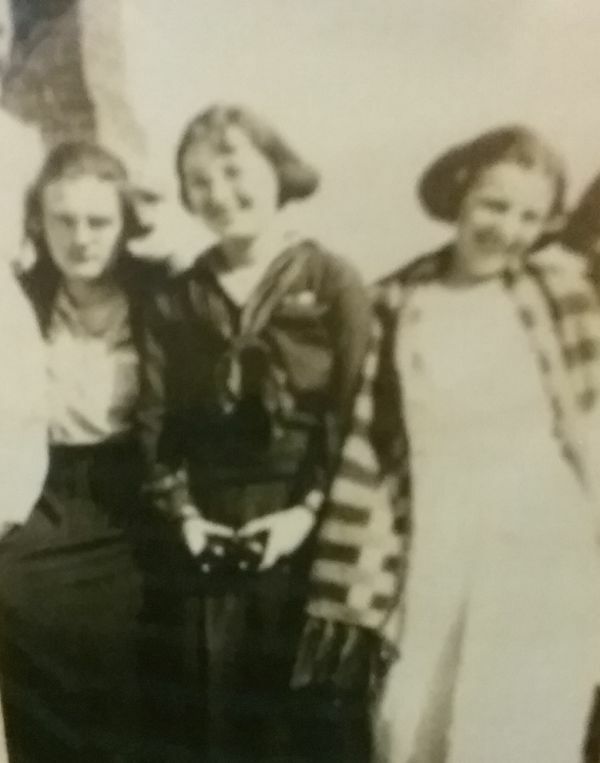 Many of the photos from the Teens and Twenties show the girls in sports uniforms. 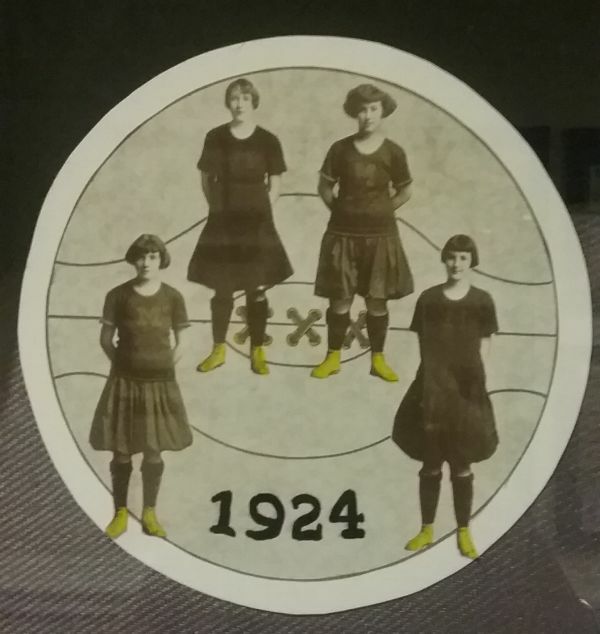 Here’s part of the basketball team from 1924. And here are some basketball players from a few years later. 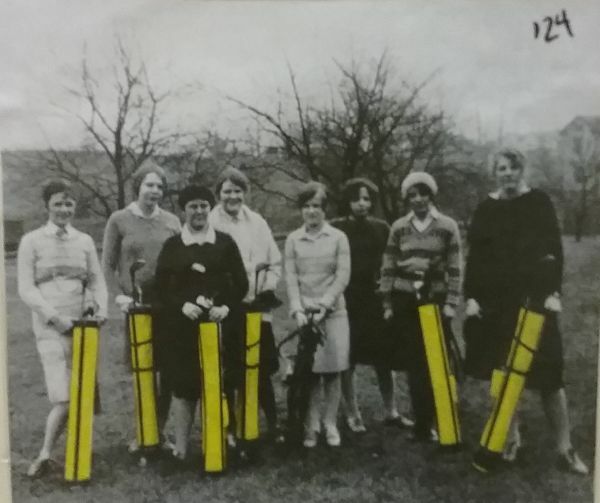 Students were properly attired for golf in 1924. Many of the photos showed the girls wearing middy blouses, that most schoolgirl of all garments. The inn really has taken great pains to remember the heritage of the old building. 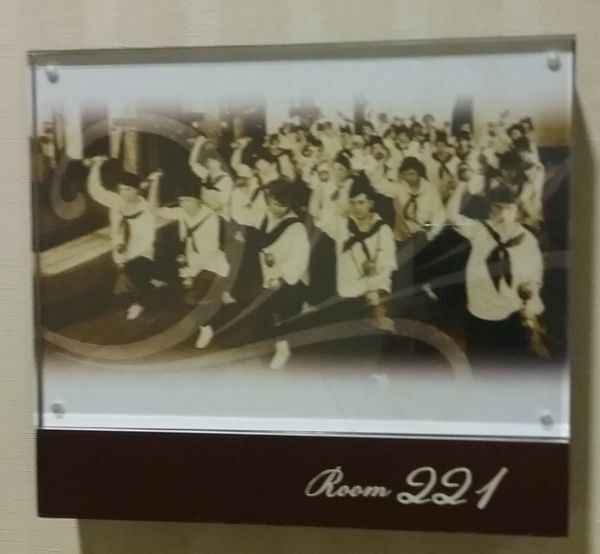 Each guest room is identified with a different vintage photo of the school and its students. One of the parlors is named for First Lady Edith Wilson, who was a student at Martha Washington for a very short time. After the college closed in 1932 (some sources say 1931) the building stood empty for a few years. 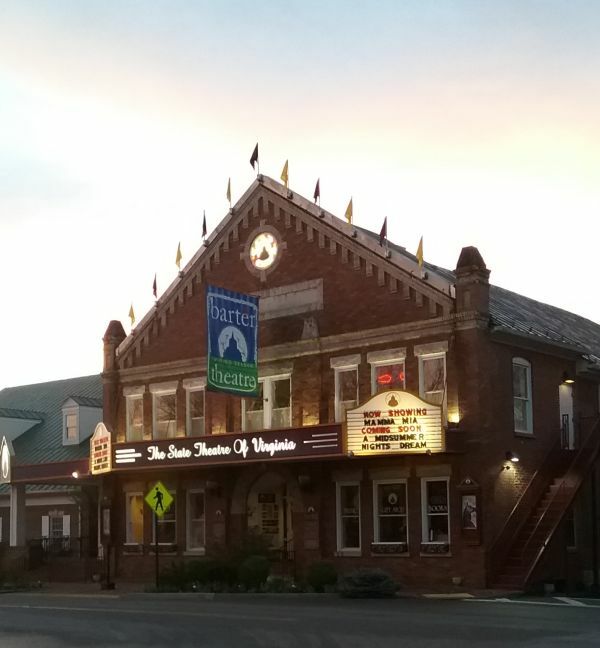 But fortunately for Abingdon, a new enterprise opened across the street – the Barter Theatre. In 1933, young (and out of work) actor Robert Porterfield got the idea to open a theatre and let people pay their admissions with either 40 cents or an equivalent amount of food. The theatre was an immediate success, and that created a need for a hotel. 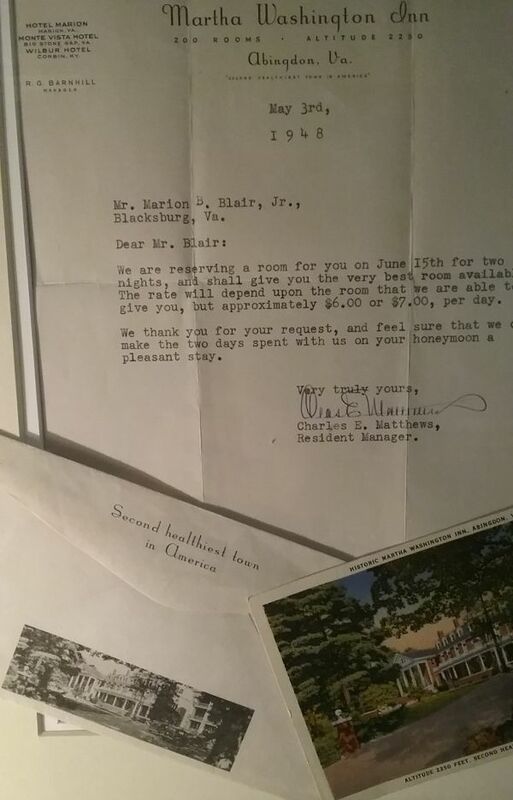 The Martha Washington opened as an inn in 1935. In 1948 Abingdon was the “Second healthiest town in America.” I would love to know which town was number one! I was sorting through photo files this afternoon and realized I’d not made a general post about my recent trip to New York City. My visit this time was a bit different, as my good friend Jill and I went with her twenty-four year old son Austin, who met up with two of his friends in the city. Much of the time was spent showing her son and his one friend the sights they wanted to see. It was really a treat, as I taught Austin in fifth grade. Every teacher ought to be able to spend some time with former students after they become adults! Actually much of the itinerary was set by Austin, who enjoys history (I wonder how that happened?) He was in fourth grade when the attacks of 9/11 happened, and top on his list was the 9/11 Memorial and museum. The last time I was in that area was before the museum opened, so it was a first-time visit for me as well. 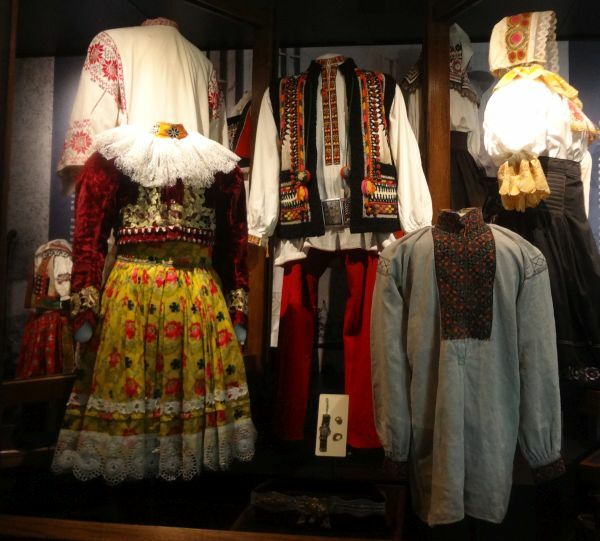 There is simply no way to explain the impact of this museum. Thankfully, there was a section of art, which helped me process it all. When the above quote from the Aeneid was revealed at the museum, there was a bit of controversy about it having being taken out of context. 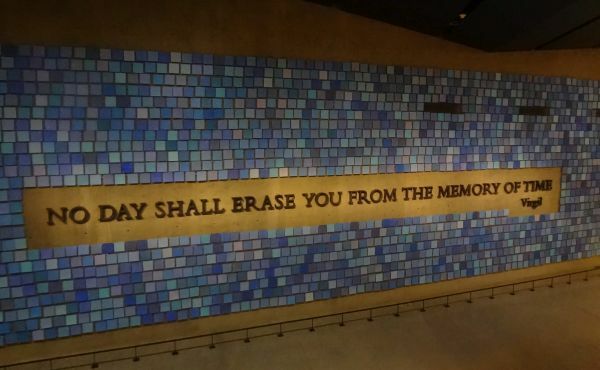 Regardless, it was a very moving wall, with the blue tiles that symbolized the way so many have described the blue of that September morning. There was an entire gallery of art, and I especially loved these two quilted banners. 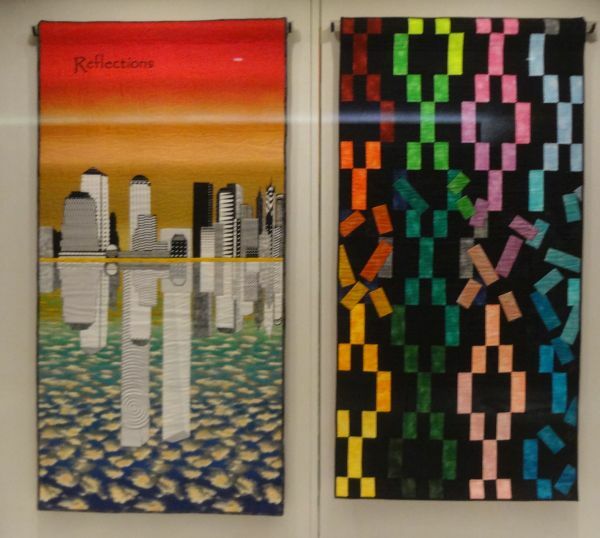 Reflections by Martha Kotter, and Cutting Off by Noriko Misawa. 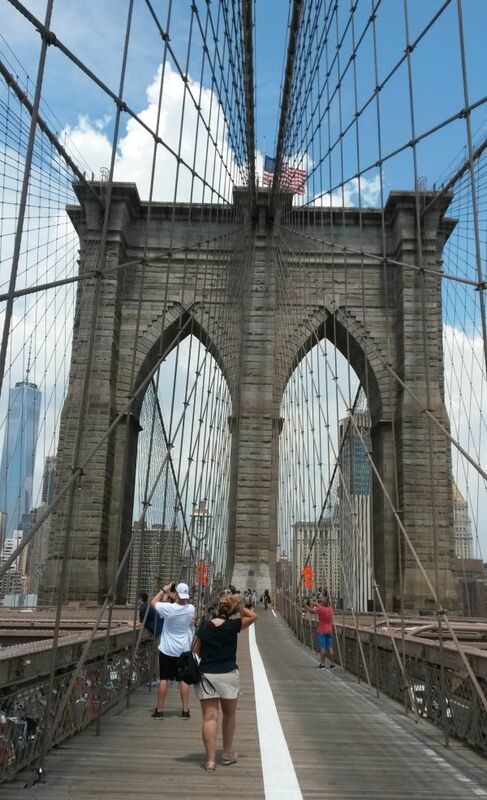 We walked part of the way across the Brooklyn Bridge. It was just too hot to go the entire way, and besides, we were getting hungry. 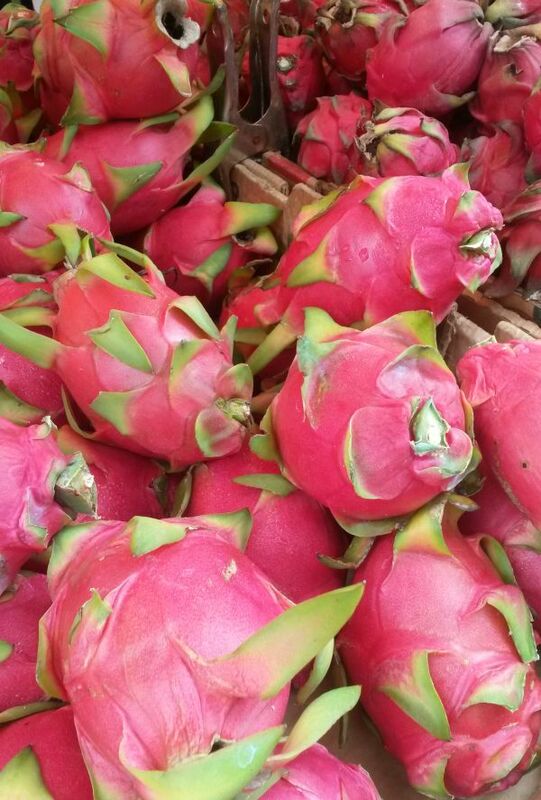 I never get tired of Chinatown: the colors and the smells and the people. 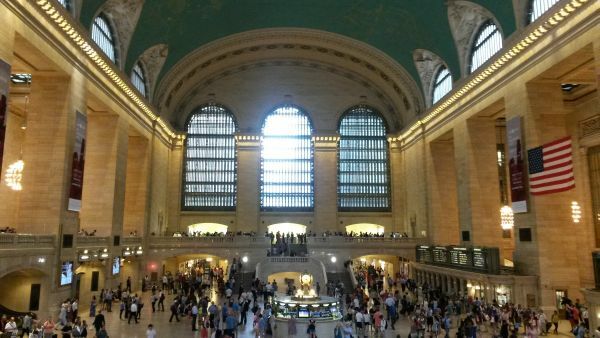 We don’t have a train station in our little town, so Grand Central was quite the experience. 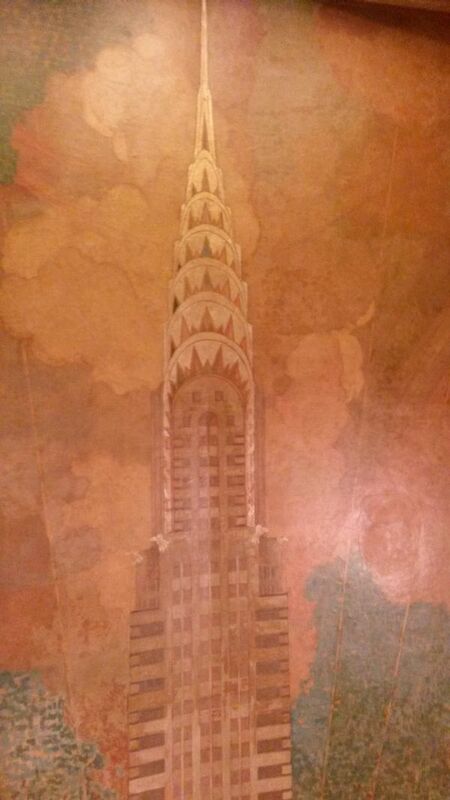 And even though visitors generally can only see the ground floor, the Chrysler Building always amazes with the stunning Art Deco details and murals. 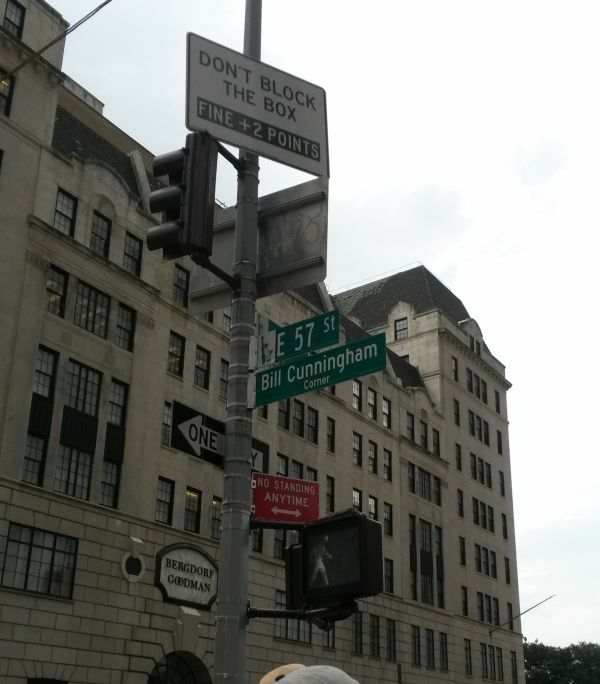 The New York Times fashion photographer Bill Cunningham died the week before we visited the city, and already he was remembered as the corner of 57th Street and Fifth Avenue was named in his honor. 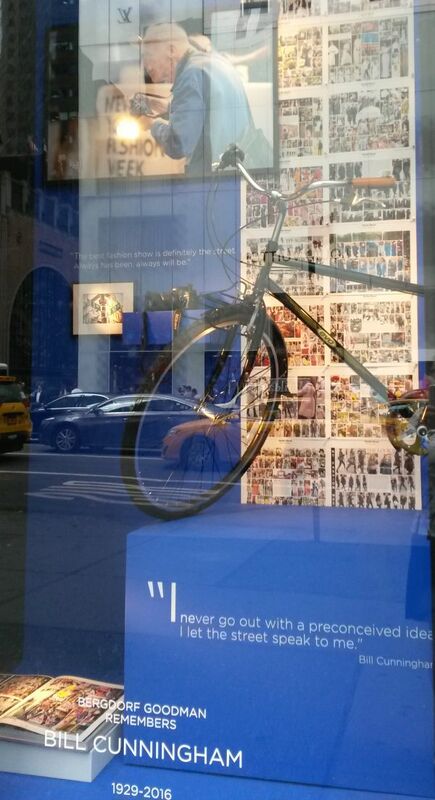 Across the street, Bergdorf Goodman decorated a window in his memory. 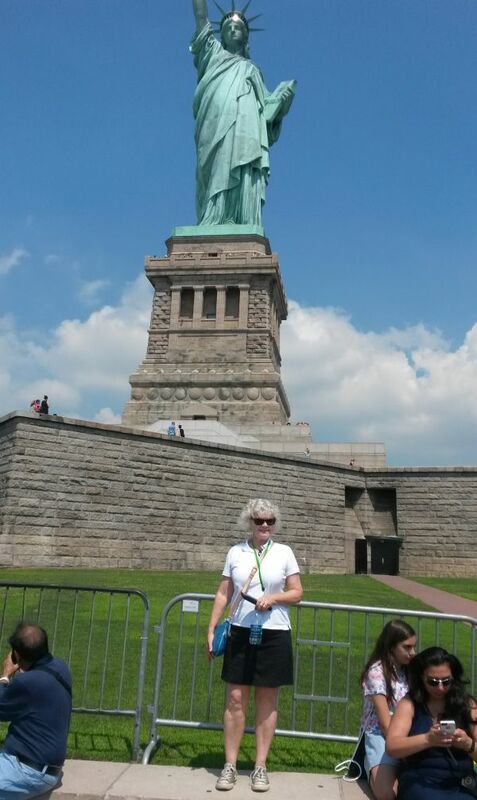 The next day was devoted to the Statue of Liberty and Ellis Island. Again, this was new to me. 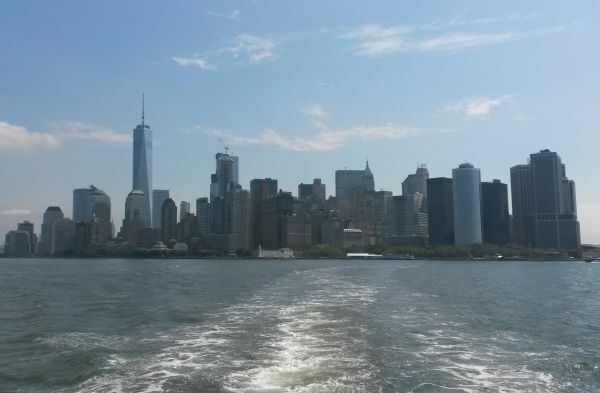 The last few times I’ve been to the city, the islands were closed due to damage from Hurricane Sandy. 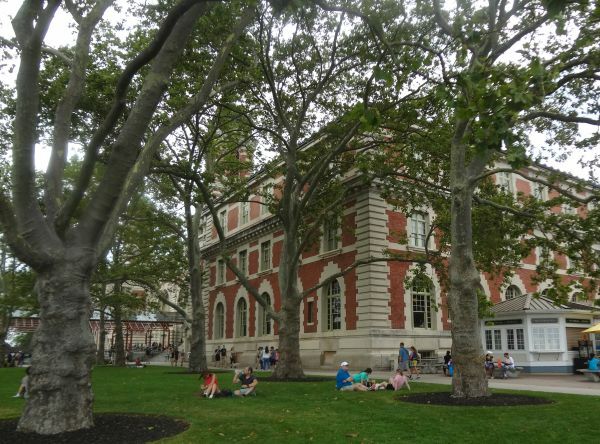 I really enjoyed Ellis Island. 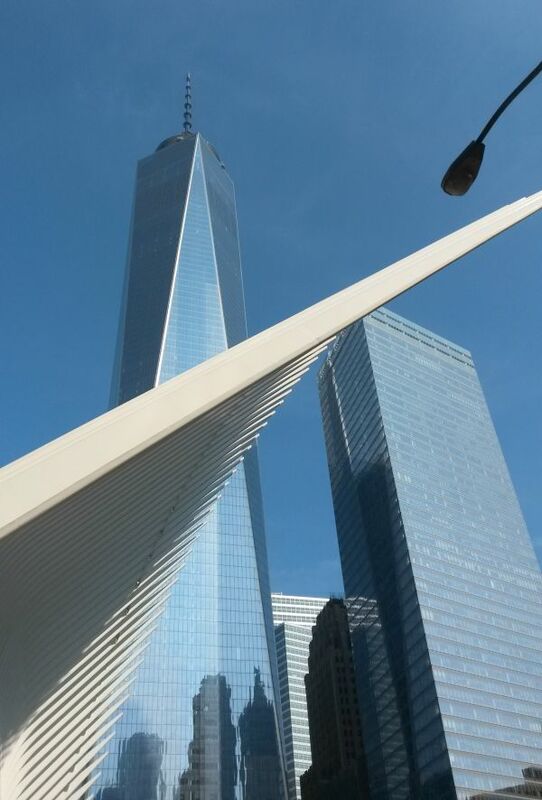 It is a site that all Americans need to visit, if for no other reason than to remind us that we are all immigrants. The only building visitors see is this one, which was the big processing center. If there are clothes and textiles to be found, you know I’ll find them. 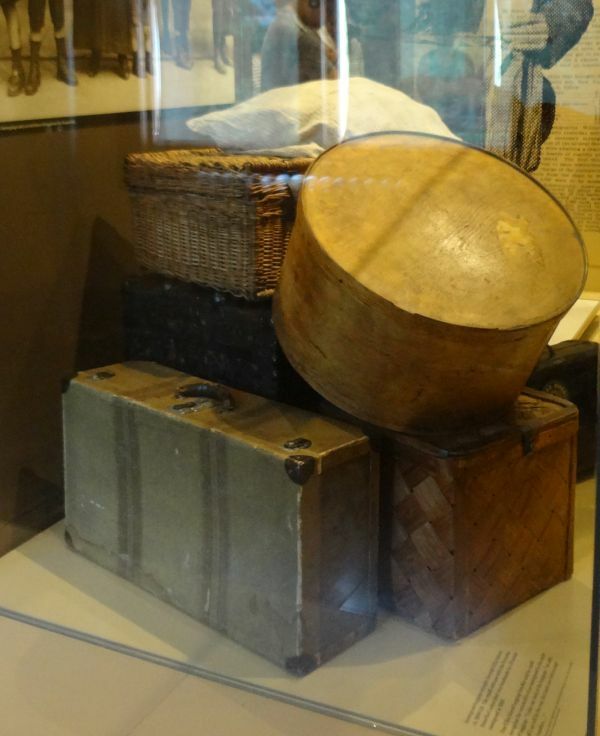 One section of the museum was devoted to some of the belongings brought to America by the newcomers. 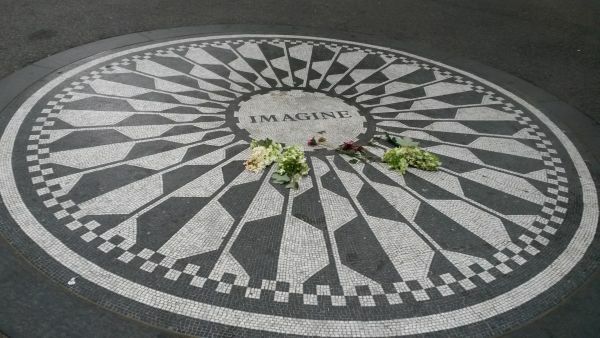 In remembrance of John Lennon, in Central Park. The settings on my camera somehow got messed up, and it produced the filtered photo above. 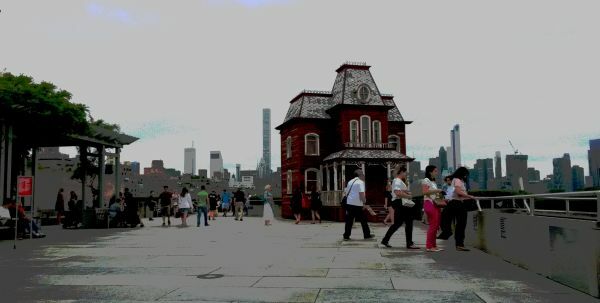 Taken on the top of the Metropolitan Museum of Art, the structure is Psycho Barn, by Cornelia Parker. And I’ll leave you with this world class view. 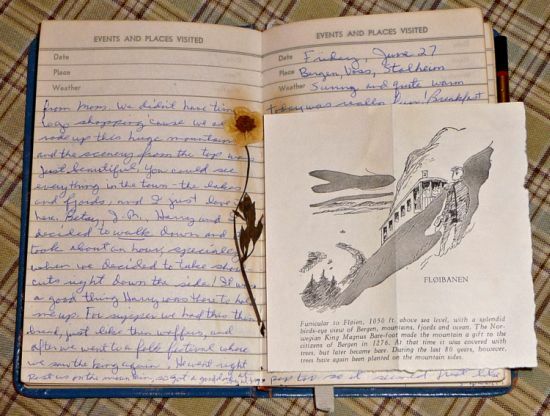 There’s something sneaky about reading the journal of another, even if the journal in question is fifty-seven years old. 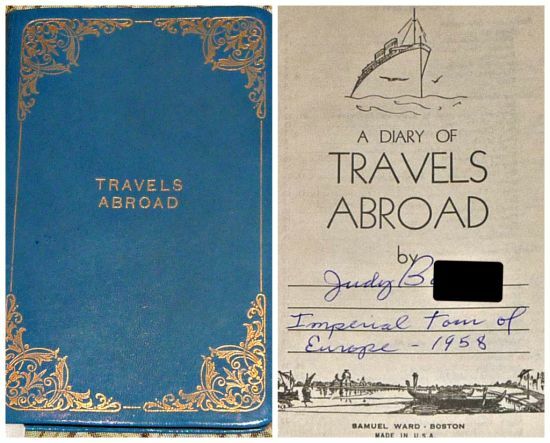 In 1958 Judy B. went on the “Imperial Tour of Europe.” It lasted all summer and was surely the trip of a lifetime – the 1950s equivalent of the Victorian Grand Tour. I first read parts of this journal when Donna of The Vintage Vendeuse started posting entries from the diary at the Vintage Fashion Guild. She then made a website for the entries, which are now being posted as a day by day entry of what happened fifty-seven years ago. There is a new site, which is great, with Judy’s entry followed by extra information and photos of the places she mentioned. You can subscribe to get the daily entry, and I suggest you back up through the old ones to read about the ocean voyage and Judy’s adventures thus far. If Judy is still alive she is eighty-one years old. That’s hard to imagine when the diary is so full of the young men she met and the fashionable clothes she wore. Or maybe not. 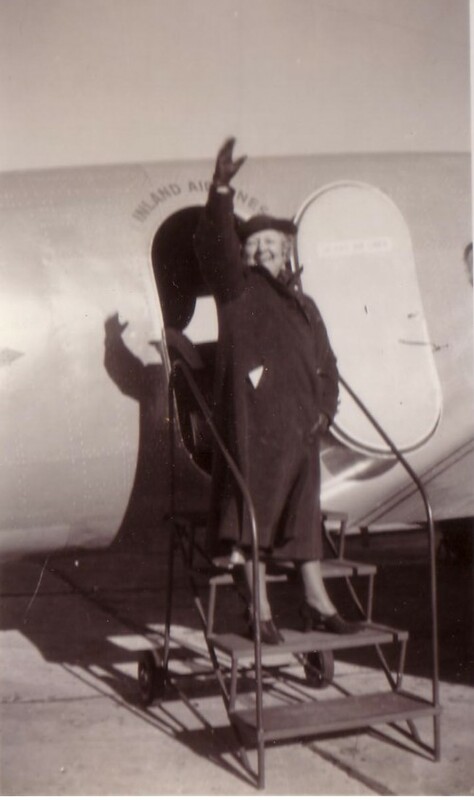 I’d like to think she is still traveling, and meeting boys and buying out the stores. It evidently is not cold enough here in North Carolina, because I’ll be traveling north with friends for the next week. I’ll be in New York City just in time for New York Fashion Week, which I’ll be ignoring, and the Westminster Dog Show, which I may have to trick my friends into attending. Otherwise it will be nonstop museum hopping and fabric shopping, with a bit of sight-seeing and warm bars and restaurants thrown in for fun. There will be scheduled posts here while I’m gone, and I’ll try to check in to reply to comments. I’ll be posting on Instagram as well, so check in for a preview of all the things I’ll find to write about here on The Vintage Traveler. Last week had several of those days that it was too cold to even think about leaving my house, and I somehow got involved with cleaning my office. It was a long overdue straightening and clearing away of clutter, and in the process I found some things that I forgotten that I had. Hiding under a bookshelf was this 1930s school binder. I bought it years ago from a retired teacher, and my guess is that it dates from her early teaching days. It was unused, and I paid a dollar for it at a yard sale her daughter was having for her. They had cleaned out the attic, and I bought a lot of old teaching things that day, all of which are long gone, except the binder. In the binder I’d stored some articles I’d taken from sewing magazines and I’m looking forward to revisiting what I thought was important enough to save ten years ago. The binder itself dates from the mid 1930s. The plane flying is probably a DC-2, which was first produced in 1934. Not that I know anything about airplanes; my husband identified it for me. I kind of wish it had been gently used, or at least had the scheduled penciled in. I love the ultra-modern train, but I love the traveler’s outfit even more. Of course, this was back when girls’ sports took a real backseat to those of the boys. Still it’s a bit disappointing that the artist didn’t at least show a girl basketball player. 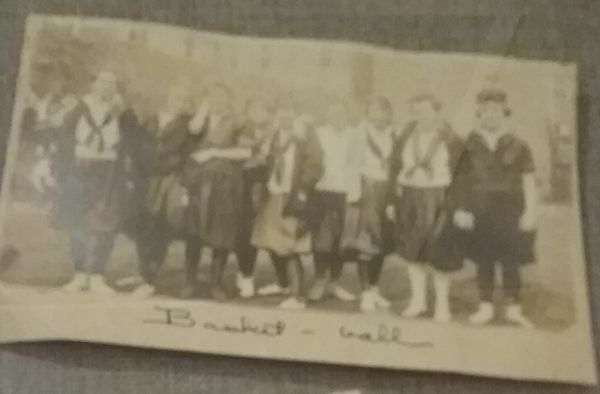 In many schools it was the only sport that had a team for girls. 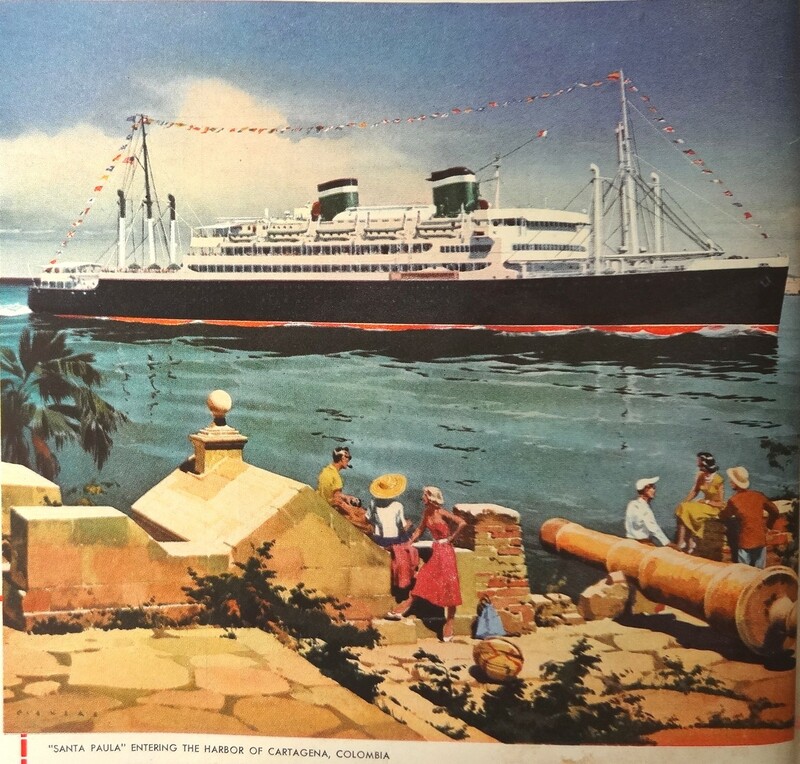 After it became obvious that airplane travel was here to stay, and that a trip to Europe could be completed in 10 hours instead of five days, the cruise line companies began to shift gears from providing transportation to providing vacations. A ship voyage was already a pleasurable experience for those with the money to buy first class tickets, and so that level of luxury was easily converted to the idea of the ship as a hotel that visited different ports. 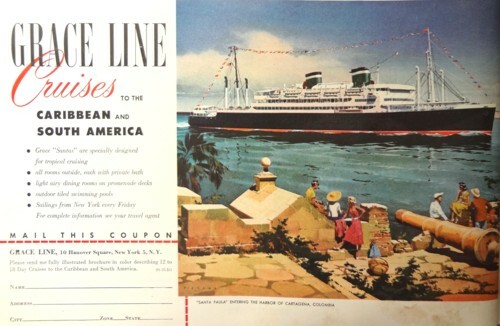 The idea really caught on after WWII, when the cruise lines got their ships back after their wartime service. Cruises to Hawaii and South America became big business. These pleasure cruises would last up to a month, in contrast to the common three and four day cruises of today. I’m sure you have all read how the 3100 passengers on the Carnival Triumph got an unwanted four day extension of their four day Mexican cruise. This was big news in the US, and completely overshadowed what was an even worse incident on a cruise in the Canary Islands when five crew members of the Thomson Majesty were killed during a routine lifeboat drill. I’m not qualified to comment on the safety regulations and procedures of cruise ships, but for an industry that has people talking about the accident of the Costa Concordia over a year later, it seems to me that they have some ‘splaining to do. Does anyone beside me remember that series on The Mickey Mouse Club where Annette took a trip to Hawaii? She went on a cruise ship and I thought it was the most fun thing ever. Several years ago a friend and I took a cruise through the Aegean as part of an educational tour of Greece. As such, we were on a small ship which held about 600 people, and I thought *that* was big. I can’t imagine being on one of those floating towns of up to 5000 people that pass for cruise ships today. Especially now. These photos are so poor that I hesitated about putting them up. But I have a little point to make, and they do at least show the product and the problem. For a very long time I’ve wanted this map of the USA cooler, made by Skotch Kooler for Esso sometime in the 1950s. I want one because I have this crazy love for old tin maps, and I can remember this cooler from my childhood. It’s a fairly common thing; I run across them all the time. The problem is that they are always either rusty or the graphics have faded. I’m wanting one in excellent condition, mainly because I want to use it. I spotted this one hanging in a mall, but even before I’d seen the price – $39.99 – I’d ruled it out. I just can’t live with that much rust. I thought the price was too high, especially given the condition, but a quick look on etsy put this in line with what people are asking online. Oh, well, someday my cooler will come in.